Last Friday, after a long day of showing films in my screening labs I proctor, I decided that a treat for myself was in order and what better than a new lipstick to perk up my mood? 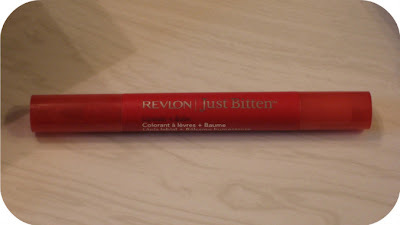 I had seen a commercial for Revlon's "Just Bitten" lip stain and decided to give it a go. I haven't really been wearing much lipstick lately because it comes off on my clothes and doesn't last for very long. The commercial stated that the lip stain would last all day -- even through meal time and would not come off on anything. It also included a balm to keep your lips moist throughout the day, something I really liked about the product. There are two reds and I chose the darker of the two, GOTHIC. I was a bit worried with the name like GOTHIC that it would be intense, but I really ended up liking my choice. The stain is really like a marker which goes on much like a marker would to your lips. It has a nice pointed tip to make application easy and precise. Some girls wear some sort of foundation under their lipstick, I don't, so I just applied it to my lips. Afterwards, you apply the clear balm which helps seal the stain and also provides some shine. My results might be a bit different, due to no lip liner or foundation, however, I found this stuff to really "stain" your lips and stay put. I wore it out one night where there would be no eating or drinking involved to see how it would fair. It stayed put all evening and didn't come off on my clothing or on my beau, which is the most important, isn't it? ;) A few days later, I wore it when we would be going out for dinner and although it came off on my napkin a bit, most of it was still on my lips and just a simple application of the balm was all that was needed. The only downside that I can find to this product is that it is really hard to get off. I tried removing it with soap and water and it didn't take much off. I also tried a bit of rubbing alcohol, which again, took a little bit off, but did not remove the entire product from my lips. However, the following morning there was little left and the soap and water did the trick to remove the rest. I really like that this lip stain stays on you and not on your clothing or your man!! It is priced at $10 and I think for a drugstore lip product it is worth the ten bucks. For the most part is does what it says and it really is a lovely shade for us vintage gals! DISCLAIMER: I purchased this product and am not being paid in anyway to promote Revlon. These are my honest opinions. Thanks so much for the review! I've been wanting to try a lipstain but was worried that it would wear off and wouldn't look very red after a while but this one looks really nice! I think I'll have to try it out. I have a similar stay-put lipstick that won't ever come off but I did have success with oil free makeup remover on a cotton ball. I just used the cheap Target brand makeup remover. Thanks for the review. I've wanted to try this myself.